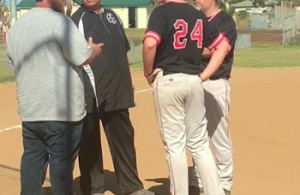 SPRING VALLEY (3-20-2019) – The Mount Miguel Matadors, who haven’t captured a league pennant since 1980, are basking in the first-place sunshine after upsetting defending Grossmont Valley League champion Valhalla, 5-3, in the league opener on Tuesday afternoon. For now, the Matadors are atop the league standings after rallying for five runs in the sixth inning to erase a three-run deficit. First baseman Trevor Darby delivered a 2-run, tie-breaking double with two outs to cap the big inning. 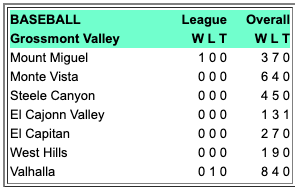 Switching Wednesday’s Grossmont Valley League opener to Tuesday (Mar. 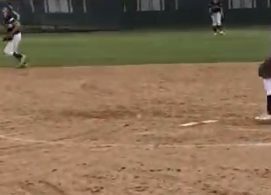 19) because of expected rain, Valhalla starting pitcher Riley O’Sullivan was throwing a no-hitter, striking out four on just 51 pitches through five. However, Valhalla went to the bullpen to start the 6th. But the “relief” came from Mount Miguel batters, as Nico Camacho lined a lead single to center field. One out later, Ricardo Partida doubled to end the shutout. Austin Ortiz walked, then JoJo Castillo singled home Ortiz to make it 3-2. Cameron Beauzec followed with another RBI base hit to knot the contest, then Darby gave Mount Miguel its first lead. Although Darby was thrown out attempting to stretch his hit into a triple, the momentum swing allowed Matadors relief pitcher Thomas Ringer to retire Valhalla on a pair of pop-ups and an easy ground ball to register the victory with his 2-inning stint. 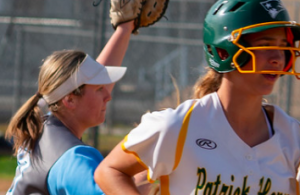 “When it was coming down to the last two innings we just knew it was our last chance and thankfully our hard-hit balls were finally finding gaps,” Darby said. Valhalla (9-4 overall, 0-1 GVL) opened the scoring in the 3rd on consecutive out-out singles by O’Sullivan (2-for-4), Kyle Casper (2-for-3) and Trey Henige (RBI). Casper then came home on a wild pitch. In the 6th, Norsemen No. 9 hitter Ethan Dunnam singled, Ryan Perot also singled, then Joseph Ingrassia was hit by a pitch to load the bases. with Dunnam scoring on another wild pitch for a 3-0 cushion. “It was a great effort by my kids,” Mount Miguel head coach Frank Coit said. “Even when they got down 2-0, then 3-0, they were scratching and clawing every inning. It was great to see. Senior star Nico Camacho allowed one earned runs over five innings, striking out six to keep his Matador club in the game. The Matadors opened the season winless in five outings before blanking Kearny, entering the Grossmont Valley League contest with Valhalla at 2-7 overall. “It’s an accomplishment because it’s my first ever win against Valhalla,” Beauzec said. “It also means a lot because it shows what our team is capable of and how we can contend.